To build a football stadium with a design with forms in the vanguard, allowing for the comfort of its occupants in a safe and sustainable manner, with the best materials, while incorporating the newest in technology for the television broadcasting of matches, is a real architectural challenge. For Juan Andrés Vergara and Luis Fernández de Ortega, of the VFO Arquitectos office, experienced in this type of monumental building, the BBVA Bancomer Monterrey stadium is their latest achievement in sports architecture. 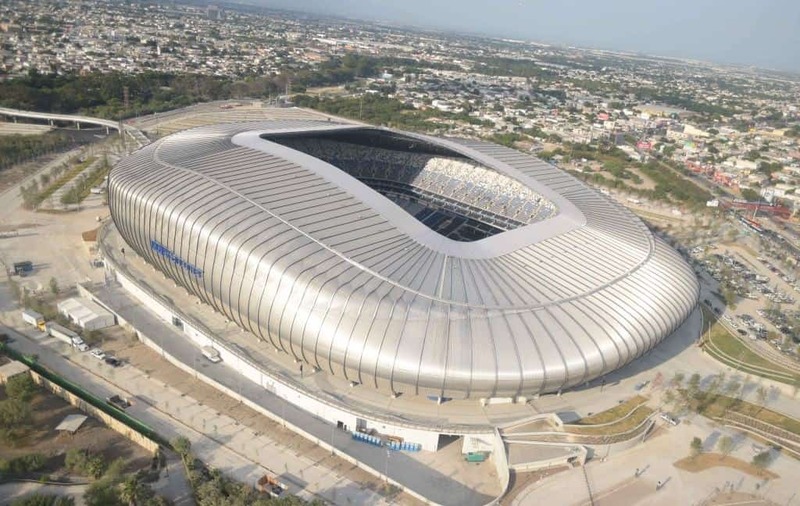 In a joint venture with the international firm Populous (formerly HOK Sports) and other companies and national and international institutions, they started the design of this project in 2007 with the idea of building a new stadium for the Rayados team and to create a landmark building for the “regiomontana” city, as Monterrey is known. “The site is right next to the slopes of the Cerro de la Silla, the most important icon of the northern region of the country. We proposed that the stadium roof have an inclination to the south and that a big window open it to the mountain. This way, you’re joining the functional part with the aesthetic and thematic parts, anchoring to its site, so that for people going to a football game, the first thing they’ll say is ‘we are in Monterrey, we are in our stadium, this is our team and we will win’ “, says Juan Andrés Vergara, CEO. VFO uses in its projects technology that allow them to create more advanced and complex forms, representing major challenges in terms of construction. “We wanted that this building be a very radical change in the quality of design in Mexico, so that the materials had to stand up to various situations. Due to the origins of the stadium’s company owner, we thought of metal pots and pans; these curved shapes could be achieved with metallic materials while achieving a brightness that reflected the sun, the colors of the vegetation and the hill”, adds Andrés. The metal structure surrounds the stadium, leaving spaces for air to enter and cool the public in a natural way, and continues over the stands with an overhang of up to 50 meters. To build it, they used Building Information Modeling, BIM, a modeling technology which allows for design the structure and allowing to know exactly the materials, locations and virtually exact amounts needed for construction. The last twelve meters of this overhang are covered by a special polycarbonate material, called Danpalon System, which allows a visual transition between parts in light and those in shadow. “It is an extremely important effect because this way people do not strain their vision as the transition is smooth, and the television cameras also benefit as well”. This material, in the opinion of Andrés Vergara, offers “great resistance and also the level of translucency we need to apply it with this function. It is very easy to install and contributes to protect the environment”. This is the only polycarbonate in Mexico that can guarantee quality and durability over 25 years and more, which is the best choice for this kind of works that represent a large investment and that must maintain their functionality for several decades. “When choosing materials, we always say that when an investment of 200 million dollars or more is on the line, one cannot give it to someone who is not experienced; we like to experiment, but safely, we like to bet when we’re going to win. And we know we will win because we have all the tools to make things succeed, the limit is always the imagination, but that imagination has to go with a knowledge of which things are achievable and that is what we apply”, asserts Vergara. In this regard, Luis Fernandez de Ortega adds: “We seek materials that we know will have the expected performance in a particular building, not delude ourselves with the issue of cost. We rely more on an already proven track record and that is why we put our trust in products we are confident will meet those expectations. One thing I always tell our team when they are doing their job, ‘keep in mind that not only you are putting your name on this, we all are, when you place your name out in front it means you’re putting forward a reputation, that forces us to be very careful with the selection of materials and systems, which is why we study those things so much”. After eight years of work, the stadium was inaugurated a few weeks ago. The result is a building that “will generate a lot of history for sport in Mexico, and will be the trigger of a higher level of design that will elevate the level of dignity of the people”, in the words of Andrés Vergara. The construction process would have been impossible without the application of the most cutting-edge technologies, using the most advanced materials and the talent and work of human hands and minds. “Now that we’ve been at the opening of the stadium, we realized that all attendees became one. This is a phenomenon that football does: it coalesces a large group of people into one that moves in one direction, and I believe that’s what a building like this really brings to a city. A building is nothing if it does not have people within it and that’s the great opportunity that this stadium represents, not only for the public, for the team or for the owner, but also for us”, concludes Luis Fernández de Ortega.